The Platform for Agricultural Risk Management (PARM), hosted by the International Fund for Agriculture Development (IFAD), the New Partnership for Africa’s Development (NEPAD) and the Food and Agriculture Organization of the United Nations (FAO) to launch a series of e-learning courses on Agricultural Risk Management, Thursday, 4th April 2019 at the FAO HQ in Rome. The official launch event of the e-learning courses will take place on Thursday 4th of April 2019 (14:30 to 15:45) at the Sheikh Zayed Center in FAO Headquarters, Rome. Keynote speakers from FAO, IFAD, PARM and NEPAD will present the courses and highlight the strategic contributions to the achievement of the Sustainable Development Goals 1, 2 and 13. 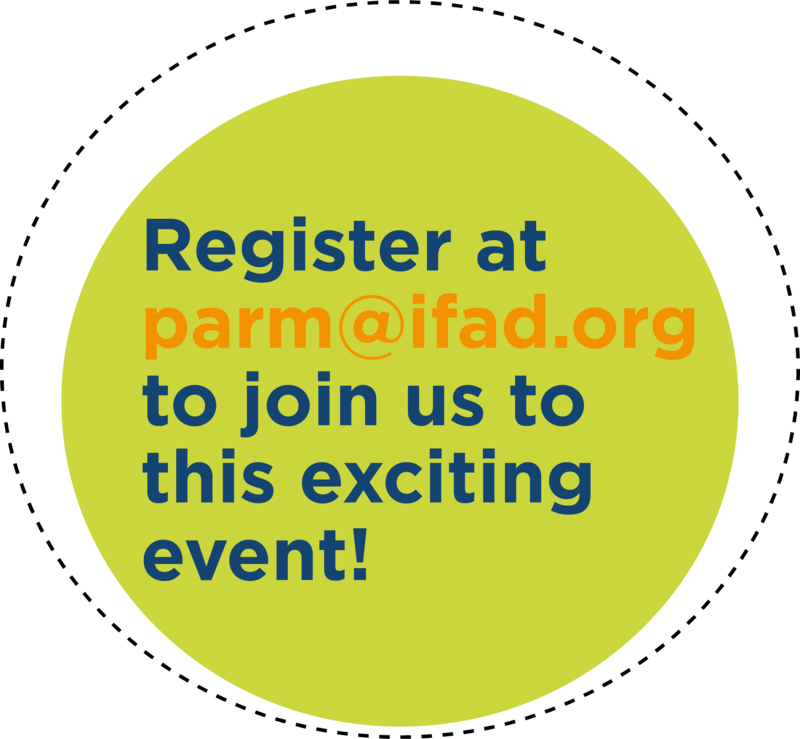 Register at parm@ifad.org by April 3, 2019, to join us in this important event and to contribute to the promotion and uptake of these valuable resources! The event will be webcast live here. Interested participants can interact with us on Twitter @parminfo with the hashtag #agrisk. 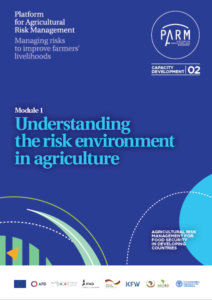 Understanding risk and its management play a central role in boosting the agricultural sector, food security, and the broader economy of developing countries. 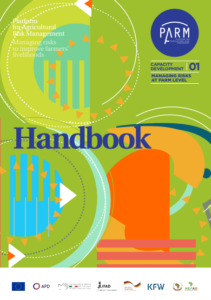 Stakeholders, including farming households, value-chain actors and policymakers need to be capacitated about and participate in the holistic assessment of agricultural risk, the development and implementation of management strategies. These courses seek to provide the necessary technical knowledge to; 1) understand the agricultural risk environment at the farm level and across the agricultural value chain; and 2) learn about the methodology for assessing and prioritizing risks, identifying the right tools and implementing a holistic risk management strategy in developing country context. The courses target farmers and farmers’ organizations, development practitioners dealing with agricultural risk management programmes/projects, operators in the agri-food value chains and service providers, policy makers and government officials, operating in the agricultural sector and beyond, affected by agricultural risks. Agriculture is a risky sector. 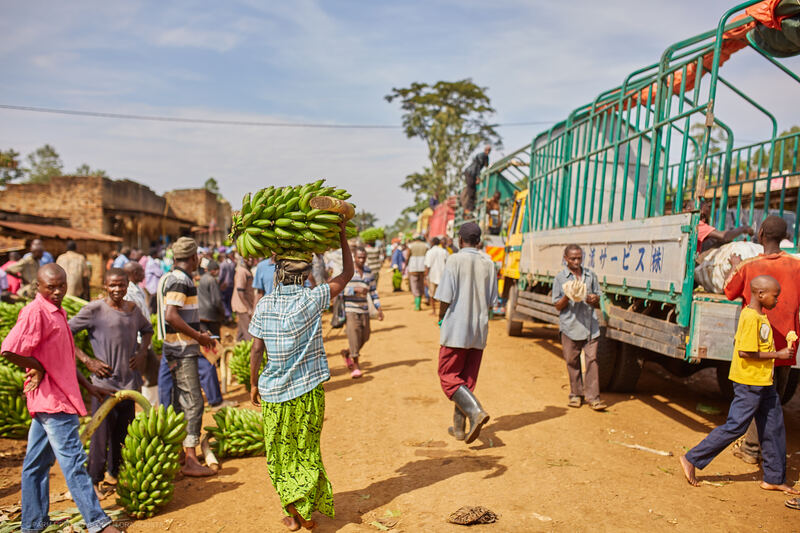 Extreme weather conditions, pests and diseases and market uncertainties are just a few examples of events that can negatively affect farming activities, posing a major threat to household’s livelihood and food security. This course will present an overview of concepts linked to agricultural risk management, describing which risks farmers face, within a holistic approach that covers the entire agri-food system. Risk assessments are prepared to develop a holistic risk management strategy. Assessing risks involves knowing how likely it is that each possible risk would occur, and what is their expected impact in terms of farm production or income losses. 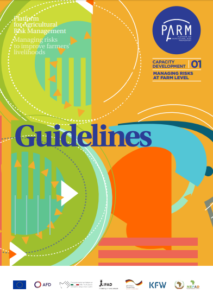 This course will look at what is needed to assess and prioritize risks including assessment methods – qualitative and quantitative – used at micro, meso and macro levels. Risks in agriculture arise from a variety of sources. There are several risk management options that can be used to either mitigate, transfer or cope with risks in agriculture. Choosing the most appropriate tool depends on various factors such as the type of risk, tools availability, and level of responsibility. This course focuses on what can be done at the farm, local area/community, and national levels to manage risks in agriculture. Responding to risk requires developing strategies which combine different risk management tools as well as policies and programs to address constraints and broader issues that create the context in which risks occur. 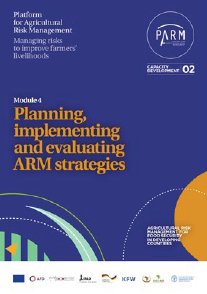 This course will present the role that major stakeholders in the agri-food system can play to design Agriculture Risk Management (ARM) strategies and make them effective and sustainable. 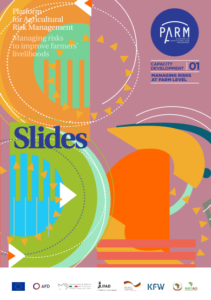 These courses are the results of the learning needs assessment workshop held in IFAD HQ in Rome in July 2015 that enabled the design of a comprehensive curriculum entitled: “Agricultural risk assessment and management for food security in developing countries”. The curriculum was designed collaboratively, involving a number of partner institutions and international experts, in particular with the European Commission (EC), Agence Française de Développement (AFD), Italian Directorate-General for Development Cooperation, KfW Development Bank, BMZ, and the New Partnership for Africa’s Development (NEPAD). How to access the courses? The courses are available through the FAO e-learning Center, which offers a number of multilingual e-learning courses and educational resources, free of charge, as a global public good. 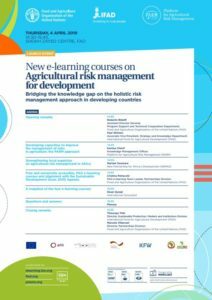 To access the courses, you can register for free on https://elearning.fao.org/ and select the category “Agricultural risk management and resilience”. The curriculum was used by PARM, in partnership with NEPAD, to generate training packages for face-to-face trainings and seminars and for integration in local University and extension services programmes, as part of its broader capacity development strategy.